I know there are a plethora of books and studies to choose from but I am curious if you have any in particular that you would suggest to someone delving deeper into the realms of esotericism/magick/music. Since school is a waste of time and money for me right now I am trying to continually formulate my own lesson plans. Any books or directions you could point me in that have had a particularly strong influence on your understanding of music, magick and life? I commend you for making efforts to formulate your own lesson plans. In the 10th grade, I reached the conclusion that the formal education system was, for me, a waste of time. I effectively dropped out of all classes except for minimal attendance in order to maintain a presence in High School. I felt any real education, at that time, came from the cultural milieu of the friends I knew there. In my early 20's I got turned on to a book by Robert Anton Wilson called Cosmic Trigger, The Final Secret of the Illuminati. Now it's Volume I of III, back then it was the only one out. Cosmic Trigger is one persons travelogue through the field of contemporary esotericism. It provides excellent introductions to the works of Aleister Crowley, G.I. Gurdjieff, Timothy Leary, John Lily, Buckminster Fuller, Kenneth Grant, Wilhelm Reich, and various others. It also looks at Quantum Physics from a laypersons point of view, Magick, Conspiracy Theory, Psychedelics, General Semantics, Ufology, and Synchronicities, and ties them all in with personally experienced consciousness research and exploration. The only area that now reads as quaint or dated, is the section on longevity and immortality. Cosmic Trigger had the initial effect of making me realize just how little I knew. For the first time that I could remember, I had a real thirst for knowledge. At the time, I was doing live sound and being a roadie on the Western Canadian bar band circuit. I started checking out all kinds books from the library. The subjects included, geometry, music theory, science, nutrition, philosophy, etc. I formulated my own course curriculum and called it Space-Time University. You mentioned magick, this seems a good place to start. First of all, magick is very applicable to the process of making music. Ritual magick has two general areas, Invocation, which means to draw down from above, and Evocation, which means to draw out from within. The parallels with music or any creative activity are apparent. But, more importantly, magick, being the esoteric system that Aleister Crowley rehabilitated, has the primary goal of discovering one's real purpose in life and then aligning to it. Crowley called this True Will. As you say, 'there are a plethora of books and studies to choose from.' Having at least some inkling of one's True Will can help select and forge a course through the vast amount of materials available. Some questions that can help with discovering one's purpose:(1) Who am I? (2) Why am I here? ie why this incarnation on this planet at this time? (3)what interests me the most? (4) what would I do if time and money weren't an obstacle, etc. I don't know if a final answer ever gets reached regarding one's purpose in life, but tentative working answers can be found to help plot a direction. Before suggesting any books, I'll cut to the chase, and impart some advice I first heard from the good Doctor Leary. He suggested that: If you want to learn anything, hang out with people who are much smarter than you are in your chosen field. I learned more about making music working with Bill Laswell, Tom Waits and some others, than I ever have from a book. The first book I'd like to recommend is the one I haven't written yet. You'll have to ask me again later. In Search of the Miraculous - P. D. Ouspensky. 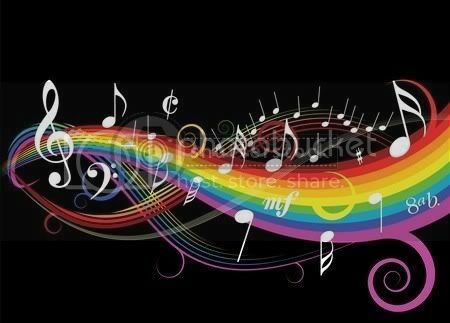 It has a lot of material on Gurdjieff's notion ( borrowed from Pythagoras and others) of how the harmonic structure of the octave can be applied to any creation process and also what thwarts the creative process. Introduces the idea that the brain and nervous system function, in one respect, as a mechanical but programmable machine. Much else of value. The Human Biological Machine as a Transformational Apparatus - E. J. Gold. The human brain and nervous system of the producer(s) and engineer(s) seems the most critical piece of equipment in the recording studio, or anywhere for that matter. Developing one's presence and attention will greatly increase the likelihood of real music being created. Magick, Book Four, Liber ABA - Aleister Crowley's system of magic. The theorems are from the introduction to part 3, Magick in Theory and Practice. The Magick of Aleister Crowley - Lon Milo Duquette. Very helpful for practical application. The Book of Lies - Aleister Crowley. Multi-leveled koan-like poetry and commentary to get outside one's mind. All of these books could be said to utilize the "method of science for the aim of religion." Or perhaps, the method of science for the aim of music. I also recommend finding and maintaining a yoga or martial arts type of practice. I hope this answers your question. If everything, or most everything is already familiar to you and you were looking for something further, let me know. It was at an event to celebrate the opening of the new Jivamukti yoga center location on the corner of Laffeyette and Houston in New York. Jivamukti was, and probably still is, the trendy yoga spot in town, where celebrities like Madonna and Sting would go to do yoga. It is a very high class, high aesthetic, green facility with top notch yoga instruction. I was there to mix sound for a group of musicians Bill Laswell had assembled that included Nicky Skopeltitis and Ravi Coltrane among others. Bill's connection to Jivamukti was through Janet Reinstra, who is a devoted student of yoga. Sting was also there to perform a set which MTV was filming. For those who don't know, the ABD stands for American Book of the Dead, a book by E.J. Gold that consists of an ancient Tibetan Buddhist spiritual practice and teaching. The ABD is essentially a retranslation of the Tibetan Book of the Dead put into a Western cultural context. Shortly after soundcheck, Sharon Gannon, one of Jivamukti's founders, was taking Sting around the room to say hello to people. I pulled out a brand new ABD I'd brought for just such an occasion, and when they got to me, I gave it to him saying something like, " this is in appreciation of all the great music and work you do." Sting gave me a kind of a quizzical look, looked at the book, said thank-you, and gave it to Sharon to hold as they moved on. Sharon gave me a look that I interpreted as a 'what the hell do you think you're doing' kind of look, but I knew Sharon and her partner David Life from back in my New York yoga days, so I figured she'd be forgiving, which she was. The meeting was short and light. 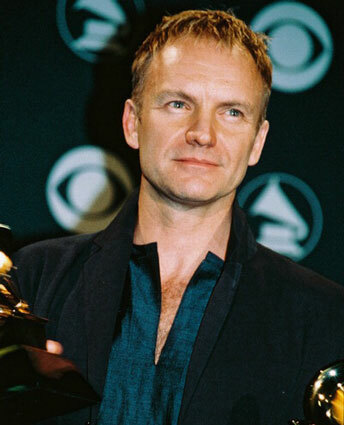 Sting mentioned that yoga really helped with his singing. Bill acknowledged him. Sting then said something about wanting to do something musically with him and Bill agreed to talk about it in the future. Sting was very low key and seemed like a genuinely nice guy. Later on, Bill did an incredible remix of his song, A Thousand Years that's on the album Brand New Day - the Remixes. The music went well that night despite an unconventional PA system in a smallish room not really designed for live music. On the way out, I ran into actor Willem Dafoe and mentioned that we a had mutual friend, Evan Lurie, composer and ex-Lounge Lizard. Had the pleasure of working with a great up and coming new band called BABY SEAL CLUB this past weekend at Prairie Sun. 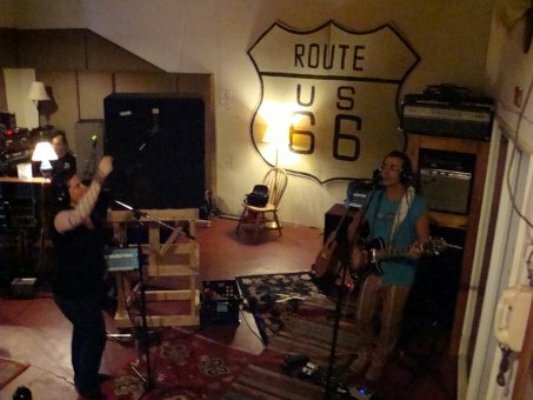 Their music draws upon an eclectic array of influences including Frank Zappa, the energy of aesthetic punk bands like the B52's or the Talking Heads, and their own sense of highly devolved quirkiness. I'm told their live shows are very theatrical due in large part to their surrealistic, neo-psychedelic costumes, and a serious commitment to whimsical fun and good humor. Band members include: Fudo on guitar and vocals, Choklit Chanteusse on percussion and vocals, Whizzbang holding down the low end on bass guitar and vocals, the infamous Agent Nineteen on keys and guitar, and the omni-rhythmic Doc Ward on the drum kit. Baby Seal Club won the 2009 North Bay Music Award for best indie band. With their new cd in production, it won't be long before the entire known Universe, and even parts of the Unknown Universe tunes in and turns on to their adventurous sound. Jimi Hendrix has a new partner to jam with in the Starlight Lounge. Lobi Traore, one of West Africa's best blues guitarists crossed over to the other side quite unexpectedly on June 1. Apparently he had just finished a gig in Bamako, went home, told his wife he wasn't feeling well, then died sometime in the night. Lobi was just 49. He is survived by his wife and four children. I had the great pleasure of recording two albums with him in Bamako, Mali, an acoustic one called Barra Coura , and an electric one that's at the cd manufacturing plant as we speak. Barra Coura is Traore's one and only 'unplugged' release. It featured him on acoustic guitar and lead vocals. Except for the first track which had Adama Couloubally playing a traditional bass instrument called as balon, only one other musician accompanied him with an acoustic guitar and background vocals. We recorded this in Abdoul Doumbia's living room after clearing it of all furniture. The hard-surfaced reflective walls were completely bare except for a framed, stylized picture of the 99 Names of God in gold, arabic script. I set-up my 'control room' station just outside on the porch. The dynamic of Lobi's sound on Barra Coura ranges from raw and gritty to intimate and light. As he recorded, I remember thinking that this must be the African equivalent of Mississippi delta blues. All of the songs were first takes, and no overdubs were added. This music is about as real as it gets. Traore's electric album, Bwati Kono, recorded with his group at a club he played at in Bamako during off hours, is due for release any day now. We mastered it about a week before he died. It's even more raw and gritty than the acoustic one. Producer Aja Salvatore and myself attempted to authentically capture the sound of Traore playing in a Bamako nightclub which meant micing the vocals through an overdriven PA system. The difficult recording conditions - no isolation, groung loops to contend with, etc. only contributed to the authenticity of the sound. I didn't know Lobi very well, but he presented himself as someone extremely unpretentious and down to earth. His disposition was reserved but cheerful whenever I saw him. Traore was not a tragic bluesman living a self-destructive lifestyle. Paradoxically, he had a sense of innocence and playfulness, yet also seemed not unfamiliar with the struggles of life. I want to say that he sometimes had a look of world weariness, except that he wasn't weary at all, just experienced. Lobi was an accomplished guitarist with a great deal of soul. Bonnie Raitt, no slouch herself on the electric slide guitar, after hearing Traore play on a trip to Mali, invited him to a private jam with her. He was also friends with Ali Farka Toure who had produced one of his earlier albums. Both Barra Coura and Bwati Kono are field recordings from Bamako, Mali. Produced by Aja Salvatore and engineered by yours truly, they were recorded using a Macbook laptop and the Digi 002 Pro Tools system. These cds were mixed at Prairie Sun in Cotati, CA and mastered at High Velocity in Grass Valley, CA. Just received a cd of one of the more musically adventurous recordings I had the pleasure of participating in last year, the Raga Bop Trio featuring Steve Smith on drums and konnakol, George Brook on sax, and Prasanna on guitar. Both George and Prassana are well versed in classical Indian music. Brook's sax tone is rich, warm, and full of life. Prassana's sound and virtuoso playing is more recognizably Indian. He incorporates elements from south Indian Carnetic music. Steve Smith is just simply one of the best jazz drummers I've ever recorded. The cd is scheduled for public release on July 20. Raga Bop Trio plans to tour later in the fall. Recording in West Africa a few years ago with the Kanaga System crew, we based ourselves out of Bamako, Mali staying at the compound of master Djembe drummer Abdoul Doumbia. A road trip was planned to Abdoul's ancestral village Zambougou to meet up with and record some musicians. Aja, Kanaga's fearless leader and the main organizer of the trip, also planned to stop off in Segou, Mali to arrange a recording with some of the more traditional drummers. Segou had been the capital of the Bamana empire in the 18th and 19th centuries. According to Aja, older, more traditional drumming styles could still be found uncorrupted in Segou. Timing is very casual in Africa. A large van was hired to carry all of us plus equipment. It was scheduled to meet us at 10 am at Abdoul's compound. The driver and van finally arrived at 2pm, a mere 4 hours late. Still, there wasn't any problem, the plan was to reach Segou by dark, and it was only 3 hours away. The van was packed and we were on our way out when the driver announced that, before we could go, he would have to drive to the other side of Bamako, in the opposite direction, to give his wife the money he'd just received for the trip. Not having much choice, we went along with it. Tensions started to rise after about 20 minutes of waiting at the driver's residence for him to do whatever he had to do. It was almost 4pm by now. Finally, Aja said, " that's it... if we don't leave RIGHT NOW! we're cancelling the trip. Literally, within seconds of him saying that, the driver jumped into the van and said, " Ok, let's go." We made it to Segou just as the sun was setting. Aja had wanted to track down some of the old school master drummers for a possible session on our way back from Zambougou. He found someone, I don't know how, but he was a younger drummer who agreed to round up the drummers we were looking for. After getting some supplies from the large open air market, we set off for the village. We finally arrived to Zambougou around 8:30pm. They had put up an American flag to welcome us only they didn't know which way it should go, so it was upside down, which, given my feelings toward the Bush administration, was kind of appropriate. Zambougou is your quintessential African village, no electricity or running water and all kinds of livestock wandering about - cows, geese, chickens, ducks, goats and a scrawny dog or two for good measure. There was a local Peace Corp worker in residence who decided not to greet us. Apparently the village elders had issues with the Peace Corps and had voted not to allow anymore of their workers in the village. One of them had managed to get a woman's clinic built for birthing, but no one used it. I'm not sure why, but judging from the number of children roaming about, they were somehow managed to give birth anyway. The next day we recorded a group of Corejuga musicians in a grove of young nime trees just outside the village. I was told the Corejuga are a caste of itinerant travelers who use comedy, humor and laughter in their music and rituals for the purpose of healing. They dress in a way that makes you think of African troubadours, which is, I guess, what they are. Bright, colorful, homemade clothing, funny hats with tassels, and lots of gris gris pouches hanging from their clothes. One of the younger males wore a wig and a dress and acted more effeminate. They seemed partly clowns, partly storytellers with an innocence that belied a deeper wisdom. They reminded me of The Fool card from the tarot. The Core Juga is not just a type of music. The music is part of a ritual that involves dancing. We asked them not to dance for the recording but did get them to do one extra piece so they could dance for photographs. We left Zambougou the next morning. It seemed like the whole village turned up to see us off. We arrived back in Segou in the early afternoon only to discover that our liaison who had promised to round up some drummers had failed to do so. However, he did takes us to his drumming teacher who was able to find some other musicians. An arrangement was made to record an album with them in an open area in the teacher's backyard. The ground was all dirt, no vegetation, as one would expect in this sub-Saharan equatorial climate. The stone walls of the nearby living quarters contributed to excellent acoustics for recording drums. The line-up consisted of 2 bongolo drummers playing rhythm, a kinkenee hand drum played by the teacher who later switched to a djembe toward the end of the session, and another drum called a ganga which looked similar to a kinkenee. There was also a male singer and a female singer. I had enough channels to use an ambience mic, something I always try to do because it adds so much life to a recording. I positioned the ambience mic to pick up the reverberation of the drums while avoiding the reverberation of the vocals. Two musician friends of ours Adama Couloubally and Mousa from Bamako were part of the group that accompanied us on the trip to help out. For his lunch, Adama had brought along a live chicken from Zambougou which he strung up by its feet inside the van to keep it passive. During the session, Mousa and Adama were behind me taking turns listening on an extra set of headphones. They both enthusiastically raved about how good it sounded, which I attributed to having the ambience mic quite prominent in the monitor mix. Drums bouncing off of stone surfaces in an open air situation gives a very powerful sound. At first I attributed the strong effect the music had to still becoming familiar with the different kinds of live music in Mali, but then noticed that everyone else, both African and American seemed visibly affected by it. Mousa, in particular, was running about excitedly telling people in Bamana, his native language, something that sounded extremely important to him, some kind of truth that he urgently wanted others to grasp and realize. Mousa, who seemed in his mid to late twenties at the time, was an experienced and accomplished djembe player that Aja had used many times as a sideman. The fact that a seasoned, nearly local - he grew up in Bamako - drummer was so profoundly changed by these traditional rhythms, indicates, to me, that the magick in this music was real. Our first stop after we loaded the van was to a millet beer establishment, the local musicians beverage of choice. Over a communal gourd of beer ( I didn't partake), seated outside waiting for a much larger container to be filled, Mousa, for some seemingly telepathic reason, started to talk to me about money. He started off saying (in translation), " Don't worry, everything is going to be all right. He said that money was like fire, a transitory fuel. That it will naturally come after work is done." This sage advice was coming from someone who, at that time, probably possessed not much more than the clothes on his back. Most of the money he did earn was from tips earned from playing music at weddings. Since that time, Mousa was able to emigrate to the United States where he now shares a beautiful home with his young family in Northern California. The drive back to Bamako was long and cramped with many stops - a military checkpoint, delivering a package, visiting our interpreter Soulay's family, etc. What should have been a 3 hour trip took about 5, but we finally made it back home. Welcome, World, to this blog, a mix of all things Oz as reported by one unit of the set, "All Things Oz," myself, Oz Fritz. It's a mix because that's what I do, I'm a sound engineer by profession. Getting a good musical mix is a significant part of our job description. I've been extremely fortunate to have worked with master musicians and producers of various kinds over the years, and have experienced some extraordinarily interesting musical situations, tales of which I will regale with you here....soon! But I have other interests and activities which will show up in the mix: science fiction, quantum physics, magick, films, the healing power of music, etc.